This trick deck is a great stop-motion animation type effect by Dan Harlan. It's a sequel to the original Card-Toon, and the only difference is the artwork of the animation - the method is unchanged and the same. In the original Card-Toon, a stickman magician pulls the selected card out of a hat. 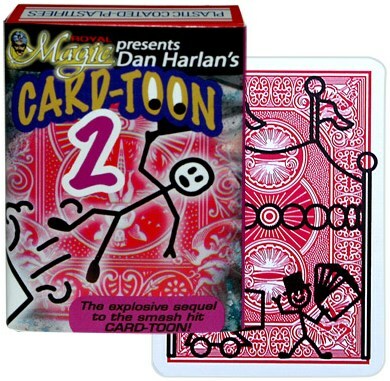 In Card-Toon 2, the stickman magician is a circus performer who flies out of a cannon, and bounces off a wall holding the selected card. The handling is not difficult to do, and basically requests of a single and simple "move" that you will need to practice but should master easily. Most people seem to have a slight preference for the original Card-Toon 1 with its more traditional magic flavour, but both are good. Spectators love the effect of the flipboard animation, which at times can overshadow the magic of the final reveal, but either way it almost always goes over well. It is one of the more memorable tricks I do, especially if you personalize the apprentice magician and really get into the presentation and story-line.